Aloha! My favorite type of recipe is the type that promises to be easy. These easy Hawaiian Haystacks fit that description. 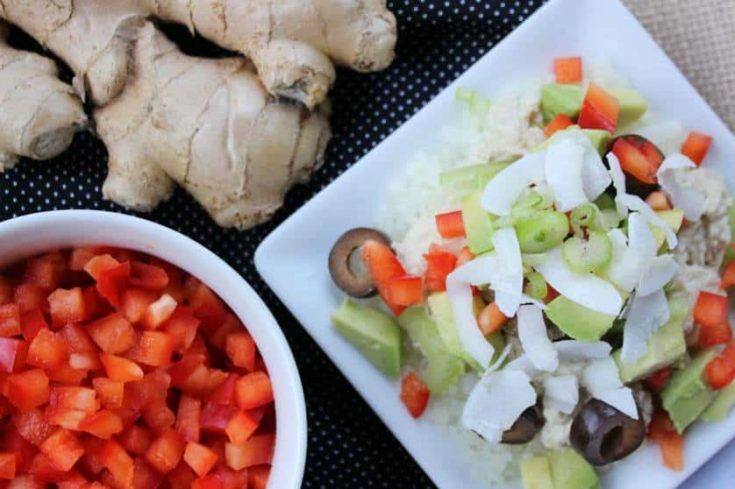 Easy cauliflower rice smothered with a delicious, flavorful creamy chicken and gravy sauce, topped with olives, coconut slivers, avocado, red pepper, green onions, celery, and chopped macadamia nuts. 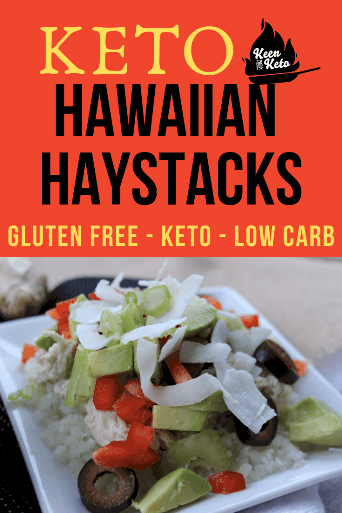 Actually, my most favorite part about keto Hawaiian Haystacks isn’t even how easy and simple it is to make. The best part about this recipe isn’t that it’s easy, keto, low carb, fast, or even delicious. Have you forgotten that I’m a mom? With four children? 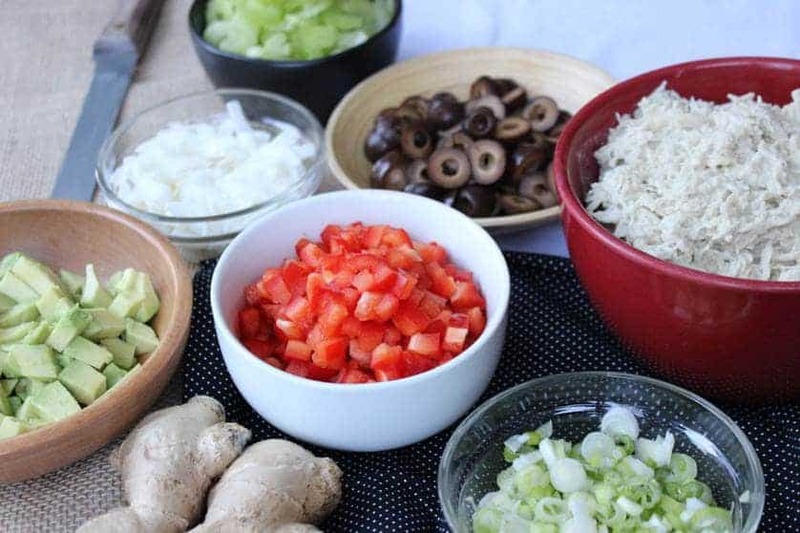 Four children who happen to be individuals, with individual tastes and unique inclinations to make their mother furrow her brow, clench her teeth, and reach for the boxes of bright sugary cereal instead of cheerily toil over a stove for hours to make a complete, healthy, nutritious, low carb meal for her little dears. Um, yeah, where was I? Oh yes. My absolute all-time favorite part of this meal is that my children will eat it. ALL of my kids will eat it. Sigh…what else could a mom ask for? Really, I could die in that moment and be happy and satisfied. Also, just a thought: I probably need to get a real life if that’s all I’m living for. Really though, I do love my children more than anything, and I understand that children have highly sensitive taste buds. I kind of feel for them. What if half of the stuff you tried to eat just didn’t taste good to you? And then some big person tries to force, cajole, punish, or bribe you into eating those foods every single day? 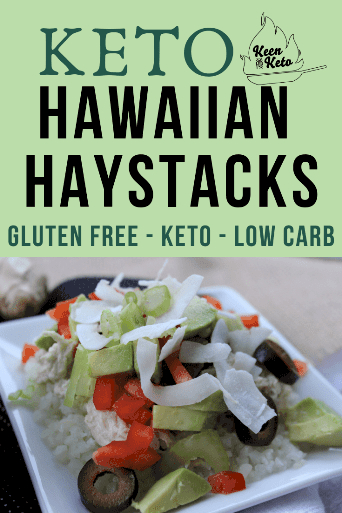 My kids would say their favorite part about these low carb Hawaiian Haystacks is that they get to choose. These days, I’m leaning more toward healthy build-your-own meals like this for that exact reason. If you eat these low carb Hawaiian haystacks at our house, there are rules. The rules keep mom sane, knowing the kids are eating vegetables. The rules keep the kids happy, knowing if they really hate that one ingredient, they can skip it. Everyone has to have cauliflower rice and the chicken (or turkey) gravy. You must choose at least 3 toppings. Another reason I’m posting this right now is because I miss Hawaii. Never did I ever think I’d ever go. We had the chance to go last month when a dear friend was getting married and it took us too long to get things arranged, so the wedding cruise ended up being full. We’d already bought my mom’s ticket to come watch the kiddos for us. 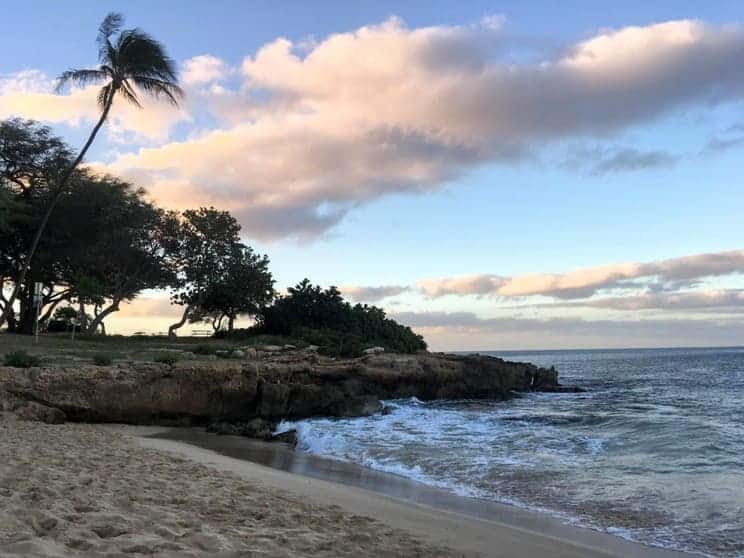 So, my husband thought quick, remembered he had a cousin living in Hawaii, so we ended up staying with his family and having a beautiful time. 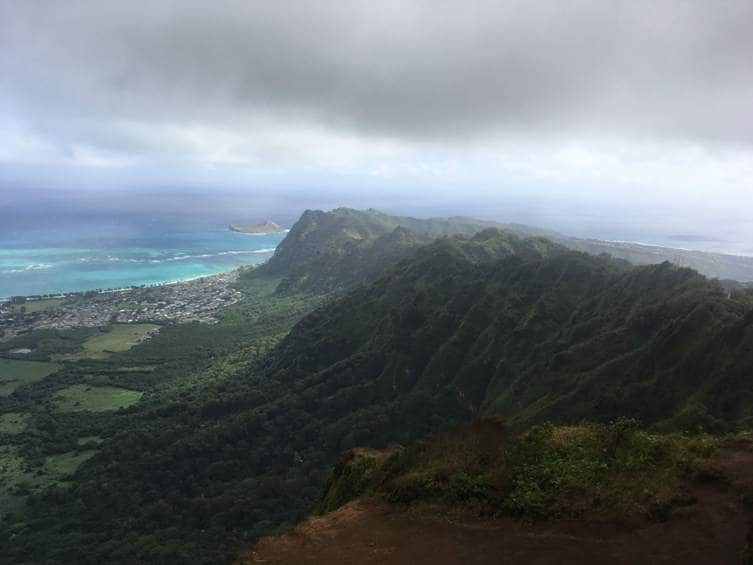 Oahu wrapped its arms around me, comforted me in my sadness at missing my friend’s special day, and made me want to live there forever. The funny thing is that Hawaiian Haystacks are not…exactly…Hawaiian. They’re just called Hawaiian because they usually have coconut and pineapple and the Hawaiian culture is infused with lots of Asian influences (hence the rice and crunchy chow mein noodles in typical higher carb versions). The next best part of low carb Hawaiian Haystacks, aside from the fact that my kids LOVE this recipe, is that it’s super flexible. If you don’t like one of the toppings, skip it. Or if you have an awesome idea for a topping that I don’t have listed here, FIRST, come tell me about it in the comments so I can try it too. Then enjoy it on your own healthy Hawaiian haystacks. One thing I like to do sometimes to make this more authentic (because this recipe is SO authentically Hawaiian) is to use coconut milk in place of the heavy whipping cream or chicken stock in the chicken gravy, or both if you really want that coconutty taste. If you’re replacing the heavy whipping cream and use coconut oil instead of butter, that would make this recipe dairy free, too. If you’re not dairy free or avoiding dairy, you can also add shredded cheddar cheese to your haystacks. I didn’t add it to the recipe because I tend to forget toppings (there are so many options! ), but it’s definitely a tasty addition. Another great suggestion is to save this recipe for Thanksgiving or Christmas or Easter, when you have tons of leftover turkey to use up. I hope you love this gluten free Hawaiian Haystacks recipe as much as our family does! 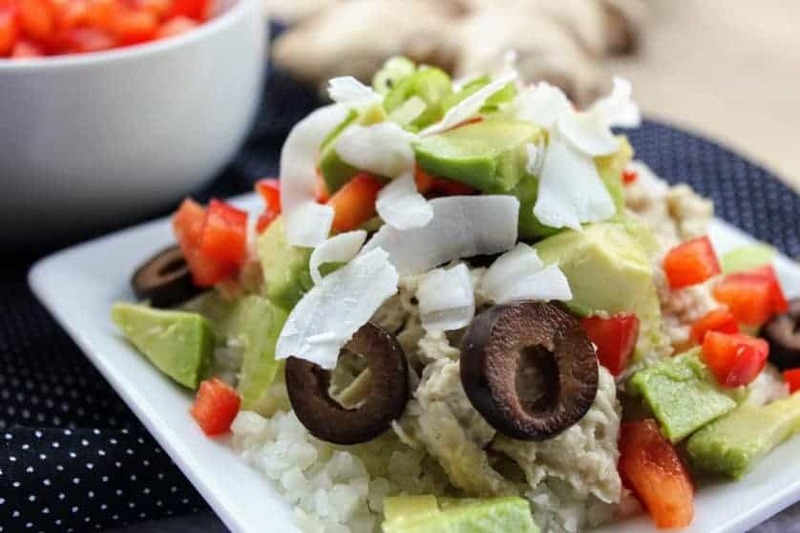 Easy cauliflower rice smothered with a delicious, flavorful creamy chicken and gravy sauce, topped with olives, coconut slivers, avocado, red pepper, green onions, celery, and chopped macadamia nuts. Great for using up leftover turkey or leftover chicken! In a small bowl, add gelatin to cold chicken stock. Stir gently until dissolved. Set aside. Heat remaining gravy sauce ingredients in a large saucepan or cast iron pan until it comes to a gentle simmer. Add the chicken stock and stir. Bring to a boil for one minute, or until the gravy has reached your desired thickness. Remove from heat. 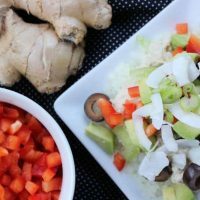 Serve over cauliflower rice and top the sauce with the peppers, celery, avocado, olives, green onions, coconut, and nuts. Just the health meal I was looking for! Thanks for pulling it together helped so I did not have to think of what I wanted for dinner! Subscribe to our email list and receive FREE Keto Foods Cabinet Cheatsheet in your first email!